Okay, I'll admit it. I did not watch 360 mostly because Anderson wasn't on. But there has to be a few other people here who do that too. Right? Yesterday's 360 garnered no comments and Monday's got five but they were all about whether Anderson should give advance notice to viewers when he takes time off. Someone mentioned (Judy? Jenn?) that maybe Anderson doesn't announce when he will take time off because 360 might lose viewers like me. John King is a good sub but what am I missing? A nightly Jackson doctor trial report, political news I can see on O'Donnell or Olbermann and Anderson's anti-bullying reports (which might be new or are they repackaged from his CNN special?). So I'm looking forward to Anderson's return. But I'm still going to change the channel when the Jackson trial news starts. It is about time that Erin Burnett, the business anchor, devoted ALL of her show, to occuping Wall Street. I don't care how she feels about it. I would accept her distain and eye rolling, but it is a MOVEMENT that can no longer be ignored by someone who's expertise was supposedly finance. Why is John King devoting time to it and now the silly set of Republican candidates if this movement were so unimportant? These demonstrators are making a statement that should be recognized as legitimate and just as crucial as the Tea Party, if not more so, because they represent the MAJORITY, the voting majority. Someone must tell Ms Burnett to get off her pretty "you know what," and get out of the studio, and circulate amongst those she least admires, before her show is canceled. As an aside, why do the children AC interviewed on Bullying remind me of the Republican candidates, especially the last child, with all the name calling?? I haven't been watching much either. I like John King, but when the topics don't interest me and Anderson's not anchoring, it's too painful and I have better things to do with my time. It wasn't me saying Anderson should announce his time off -- that's not going to happen. I'm not sure if CNN/360 think people are stupid and don't realize it's not Anderson in the anchor chair or what - but his time off 360 is like a state secret and it's been that way for years, so I wouldn't expect it to change. I'm not sure why CNN is so intent on covering every possible Republican candidate's every word while ignoring what's going on in Washington and the games Congress is playing with our current economic situation. And the nightly crime and punishment reports - boring. I will watch some bad segements with Anderson because I like his pacing and his snarky banter with Isha, but I think we all have our limits. I still don't get WHY you HAVE to know when Anderson is going to be off. If he's there he's there if not he's not. John King is my favorite sub for Anderson. I pick and choose stories with him, same as Anderson. I actually enjoy John covering politics more than Anderson, he has more genuine interest in the subject. It was I or is it me? I said I agreed with the commenter about advance notice in order to connect with viewers. But I countered it, with CNN might not allow AC to do this because the ratings of 360 might be effected. Personally, I like Sanjay better as a substitute, but John is great with political stats. 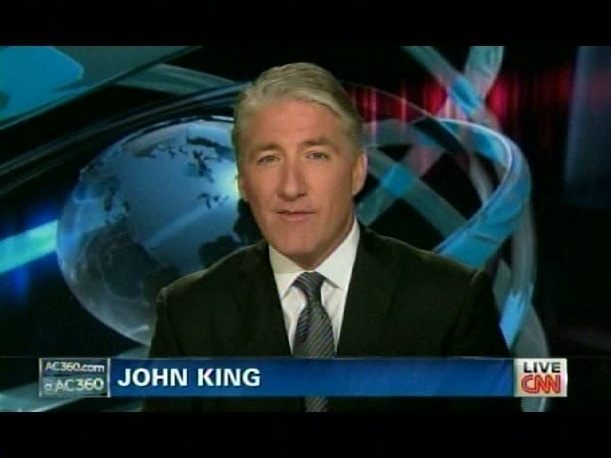 Congratulations to John King for garnering a 617 in totals for 360according to TVN at 10PM. If CNN had been smart, which we know they are not, they would have left John King as the lead in to 360 and given 'whatsherface' the 6PM slot. It doesn't matter what time Burnett is on, she will fail.